Swordfish Rodeo, Billfish Challenge, Offshore and Nearshore divisions will use Ripley Light Yacht Club. We will utilize one scale for the offshore and swordfish, and another scale dedicated to the nearshore species. Check-in boat and boat traiffic will be monitored and managed by LCO weigh-masters and off-duty members of the U.S. Coast Guard. Slip rentals will be available for reservation. The Bristol on the banks of the Ashley will again serve as the Inshore weigh-station. Boats will return and sign their release affidavits to the weigh-master, weigh up to two flounder if entered in the optional Flounder Bullseye Bonus TWT, and encouraged to join the festivities at RLYC when completed. Boat dockage will be limited, so we encourage you to travel by other means. Slip rental at Bristol will be available for reservation. Awards Banquet ~ 7 to 10pm. Awards Happy Hour starts at 6pm - assuming y'all haven't started already - and the awards and recognition portion will begin as soon as the final numbers are verified by tournament officials. Please join us in celebration and camaraderie, as we break bread and toast the spirit of helping our veterans! Each boat entry is due 4 complimentary wrist-bands at the gate. Additional guests will require payment for event entry. If any protests or polygraph discrepencies, those in question will not be presented awards or winnings until settlement. Only verified winners will be recognized. Our intention is to issue payment to winners upon conclusion of the banquet - completed/signed W-9's are required. The LCO has partnered with the brand new Cambria Hotel to offer discounted rates for our tournament guests. 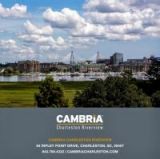 Cambria Hotel is located a very short walk to Ripley Light Yacht Club, so you can step right on or off your boat if renting a slip at RLYC, or simply plan to enjoy yourselves more throughout the festivities. Parking for boat trailers is also available, and they run a free shuttle within 5 miles of the hotel for complete access to events without concern. Call them directly to request The Lowcountry Open discount at (843)766-4322, or click the LCO Discounted Rooms to view hotel accomodations and make your reservations.